When the most respected company in the world puts its name on a real estate sign, that’s a good sign for the market and a great sign for you. By utilizing the strength and valuable resources of one of the world’s most respected brands, we bring operational excellence and innovation as a compelling value for our customers. With a clear vision as one of the most highly valued real estate companies in the market, our powerful network of brands exemplify the reputation of Berkshire Hathaway — among Fortune’s 2017 most admired companies. In March 2000, Berkshire Hathaway became the majority owner of Berkshire Hathaway Energy Company. Berkshire Hathaway Energy Company acquired a majority interest in HomeServices of America in 1998. Berkshire Hathaway employs nearly 300,000 people and owns more than 55 companies, including GEICO, Fruit of the Loom, Dairy Queen, Helzberg Diamonds, Benjamin Moore Paints, NetJets®, Burlington Northern, See’s Candies, Berkshire Hathaway Energy Company and HomeServices of America. Berkshire Hathaway HomeServices has a network of over 43,000 sales executievs in 47 states and partnered with our relocation associates, have moved thousands of family's both in the US and around the globe. Our key relationships and contacts internationally allow us to provide a higher level of relocation service then any of our competitors. A level of expertise you would expect with a global name such as Berkshire Hathaway. Contact us today and see how our reputation, technology and inovative marketing can benifit your property and real estate business. Berkshire Hathaway HomeServices Nevada Properties® is an independently owned and operated member of Berkshire Hathaway HomeServices Affiliates and is the 8th largest in the company’s national network of 677 franchises. 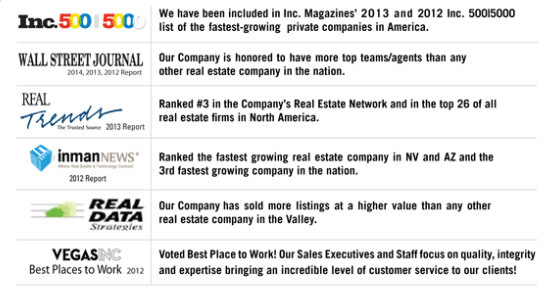 Berkshire Hathaway HomeServices Nevada Properties REALTORS® is one of the largest real estate companies in Las Vegas with more than 2,000 sales executives between Las Vegas and Arizona. We had 8,294 home closings and over $1.47 billion in sales in Las Vegas and 3,079 closings and $700 million in sales in Arizona. The company was founded in 1979 and has sold more than $60 billion in Las Vegas real estate since that time. We are established in the desert beside the growing popularity of Las Vegas, Nevada, reaching affluent communities surrounding the downtown areas where Nevada’s workforce and consumers live and raise families, attributes its success to being the real estate brokerage most chosen by the population, developed out of the 4th largest global company and brands known around the world. The Nevada Company embodies the strict policy of hiring those sales executives who serve the community with the highest level of attention to un-parallel service. 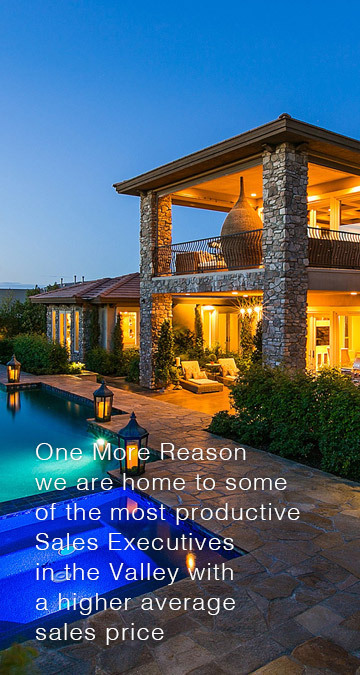 Berkshire Hathaway HomeServices Nevada Properties® sets standards beyond the competitors by engaging new and recent technologies, inventive and innovative marketing programs, and a National and International networking system that delivers results. There are numerous companies boasting these technologies but none can compare to the franchised systems connected to numerous sales executives around the world, in different languages, different countries and our own United States of America, securing Berkshire Hathaway’s brand in every country throughout the planet.